As summer comes to an end and the fall season approaches, it is the perfect time to think about the state of your home’s gutter system. If you have noticed cracks, holes or rust spots on your gutters, that your gutters have begun to separate from the roof of your home, nails or screws on the ground, sagging gutters, or water not flowing properly, it might be time for a gutter repair or replacement. 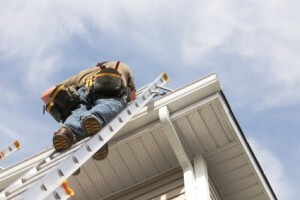 The team at Minnesota Leafless Gutters can help you solve any type of gutter or water problem around your home. We serve the community of St. Paul, MN and have spent more than 15 years striving to provide the best possible customer service to our clients. We understand that you have a lot of choices when it comes to hiring a gutter company, so we strive to set ourselves apart so that coming back or referring our team to a friend or neighbor is easy for you. The purpose of your gutter system is to keep water away from your home or structure, to prevent water damage from occurring. This is extremely important, especially given the Minnesota climate, which can bring large amounts of rain or snow in a short period of time. Minnesota Leafless Gutters can inspect your home and make a recommendation for the best gutter system for your property. We offer many different types of gutter systems, as well as more than 110 colors to choose from to achieve just the look you are going for. Aluminum Gutters are ideal for customers looking for a lower cost replacement for their gutters. Our aluminum gutters are corrosion resistant and come in many different colors and finishes so you will not have any trouble finding a good match for your home. You can expect aluminum gutters to last up to 15 years if cared for properly. Each of the Minnesota Leafless Gutter systems keeps all of the pesky leaves and debris out of the gutters so that water can flow unobstructed and away from your home. This keeps your gutter system working well and damage free. In addition, you can be confident that our gutters will not leak – our industrial fabricating equipment allows us to create seamless gutters systems for homeowners. No joints also means no leaks, which protects your home and its foundation. In addition to installation, we can also provide repair service and maintenance to gutter systems that we have installed or even ones we have not. Call our team at 612-221-0362 for more information. Get your gutters ready for this fall!